Bob Bossman, a hiring manager is searching through various CV’s to hire someone capable to handle the social media assets in the company. He goes through John’s CV and looks up his social media profiles. At the first glance, he is pretty impressed by the number of followers John Jobseeker has on Twitter and other social media platforms. He is almost about to pick the phone to call John when he notices something fishy. John has thousands of followers but does not have a single retweet on his recent tweets. Bob notices the same trend on other platforms. This is not a unique case. By paying couple of bucks on sites like Fiverr, you can buy social following with ease. There is a constant pressure on brands to amass numbers on social media platforms but that does not help in developing discussions and community. Consistent quality of engagement is the real metric of consideration as compared to sudden spikes in quantity of numbers. Considering that, should high follower count on social media be the only criteria for hiring a social media employee? Credibility – Fake followers cannot retweet or lead to engagement. Hiring managers will eventually catch on to the reality of your fake numbers. The all important job and the chance to apply to that company ever again. So how can an employer tell the difference between a real influencer over a fake one? There are several ways to filter fake accounts on Twitter and to even figure out the exact percentage of fake followers. 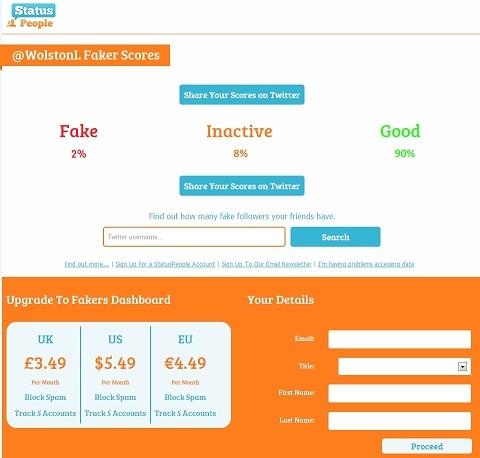 To start with, we have Fakers app and Social Baker’s FakeFollowers app. These apps will give you a clear idea about the number of fake, inactive and active followers. Then we have Twitter Counter.com which gives you a quarter year view of follower numbers. Here is a screenshot of my faker score from statuspeople.com. A faker score below 20 per cent is fine but anything above that is a red signal. There are some other ways to identify fake over real. An account which has several thousand followers but has hardly any or no conversations or discussions in posts. Major following from foreign locations and countries other than the country of origin. Followers, friends or fans without a profile picture or a bio text. The right thing to do in case of job search for social media is to showcase efforts in building a community, discussions and real engagement. The ability to create conversations in a community is a definite asset. 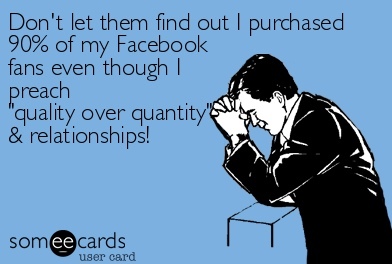 Social media is not about buying a large number of bots as followers, but building relationships and connections with real people.